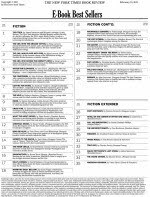 Publisher's Weekly says The New York Times will unveil its E-book Bestsellers Lists on February 13. E-books are growing, but will the lists be really different from The NYT's Bestsellers lists? We'll just have to see. Do you read e-books? If so, what reader do you use (Kindle, Nook, iPad, etc.)? Etiquette or the Lack Thereof in Today's Publishing World @ Dystel & Goderich Literary Management. Agency Agreements @ Rachelle Gardner. Is Doing a Blog Tour Really Worth It? @ The Other Side of the Story. Promotion: Faithful or Self-full? @ The Steve Laube Agency. Brand Management, Revisited @ Pimp My Novel. Quick Answers: Blurbs, Library Credits, and Print Runs @ Editorial Anonymous. Myra McEntire: The Careful Balance of Creating Buzz @ Adventures in Children's Publishing. Building an Audience for Your Blog: The Arlee Bird "Blogging from A to Z April Challenge of 2011" @ Patricia Stoltey. Synopsis Example: "House of Games" (Noir / Mainstream) @ Guide to Literary Agents. Agent Jon Sternfeld On: A Handful of Writing Don'ts @ Guide to Literary Agents. Revisions from an Agent @ BookEnds. One Problem with Phone Queries @ Confessions from Suite 500. And the Winner is..... (great first paragraph advice) @ Nathan Bransford. Decisions, Decisions: Character Choices that Matter @ The Other Side of the Story. Depth of Character @ Writer Unboxed. 3 Layers of 'Layering' in Fiction @ Writer Unboxed. Concrete and specific @ Edittorrent. Where Do Characters Come From? @ Iggi & Gabi. Superpowers of the grammatical subject @ TalkToYoUniverse. Story Middles @ Writing Roads by Linda Osmundson. New Agent Alert: Stephen Barr of Writers House @ Guide to Literary Agents. Great list as always, Brooke. I got a Kindle for Christmas but haven't used it too much yet. I going to load it up with books for upcoming trips, though.